Frank was currently working on the 9 to 3 drill but struggling with a few of the moves. We decided that continuing to work on the 9 to 3 drill would be a good place to start. Find out how Frank gained 30 degrees of lag by using the 9 to 3 drill. During his backswing he was letting his hips shift to the right. This caused his upper body to get too vertical, even slightly leaning toward the target as he finished his backswing. As you can see, he was losing a slight bit of axis tilt that he had at address. Furthermore, in the downswing he was very dominant with his right hand. Since he was pushing with his right hand, he was losing all of his lag as his hands passed in front of his right leg. Left: Pretty Nice address Center: Hips have shifted right causing the spine to lean left. Right: Loss of lag due to an over active right hand. If performed properly, the club should be just short of parallel with the ground at this point in the 9 to 3 drill. We started to work with 2 videos to help improve his technique. The first was the Maintaining The Right Hip Line Video. In this video he worked on not letting the right hip line slide to the right during the backswing. His biggest breakthrough was when he had the feeling of the right hip line actually moving to the left as he made his backswing. THIS WAS ONLY A FEELING. 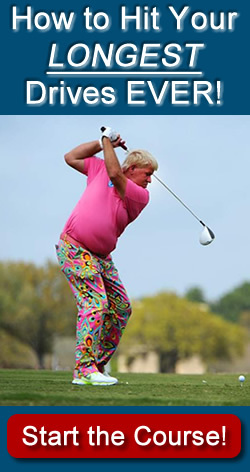 In reality, the right hip remained still as he completed the swing. Second, we worked on maintaining lag in the downswing with the 9 to 3 drill. The big breakthrough here was to keep the hands soft and actually feel as though the hands were increasing lag as he started the downswing, instead of gradually unhinging. “Feel as though your hands get in front of your left thigh and the club is still parallel to the ground. This exaggeration will really help you. Don’t be afraid to exaggerate to the point of ridiculousness at first. This will help speed the process. I would much rather see you come back with a video where the hips are shifting slightly to the left in the backswing and you’re keeping too much lag. Left: Nice setup. Center: No sway to the right with the hip and a better position with the spine angle. Right: Over 30* increase in lag compared to before. This is when all of the moves came together. You can see from the photos above that what felt like extreme exaggeration was right on the money. If you would like to see a full review of the changes Frank and I made, check out the full video below. Great video. Some really good changes for Frank. Question: I’ve done this sort of 9-3 drill before too (not with special cameras/lines/etc.) and I don’t think it’s too difficult to increase one’s lag while doing the 9-3 drill. I just focus on body rotation more than doing much with the hands/arms and I’m pretty sure my lag has also increased. The “real” thing that needs to be addressed (for me at least) is how to maintain that lag from a full backswing position. This (again, I think) is where I (and probably most golfers) tend to cast away my power. Just wondering if you have any thoughts on that. These are great questions, and bring up two big issues when working on lag. The key is to start small and stack. By starting with the 9 to 3, you have a great chance of getting the correct feeling of lag. Once you perfect this you can then move to a full swing. Since you are already familiar with how it should feel at the bottom it will be much easier to re-create. Lag is most important at the bottom of the swing. This is where the rubber meets the road. As far as hip spinning, that is one of the worst things you can do to increase lag. The faster you spin the hips the more centrifugal force being created (throwing the club away from the body) and the more lag you will lose. Having less rotation of the torso and hips in the downswing is a must in having great lag. Aside from the 9-to-3 drill, the downcock pump drill is excellent at getting you to feel proper lag (the opposite of casting the clubhead outward as you start the downswing). getting your weight over to your left side is critical to increase lag–i don’t care what anyone says. any sort of initial rotation will do as Mr. Ballard says, but a tiny lateral shift followed by a clearing of the hips is very important hence the club LAGS behind the body before you whip it thru to a good balanced finish. His statment “having less rotation of the hips and torso in the downswing” is a statement that may be true in your case if you’re spinning and rotating too quickly from the top. but it’s one that bares some attention and care. watch any video of big hitters or any tour player. at impact their hips have really cleared out of the way! Good point! I think many of the golf students Clay works with suffer from the hips being overactive and opening far too quickly and also severely, starting immediately into the downswing. Getting the hips to clear occurs far later in the swing, but yes, still needs to happen. You are correct, a proper weight shift is crucial o accumulating lag in the downswing. Although this doesn’t mean the hips should spin aggressively. Lag is created when the clubhead lags behind the hands in the downswing. 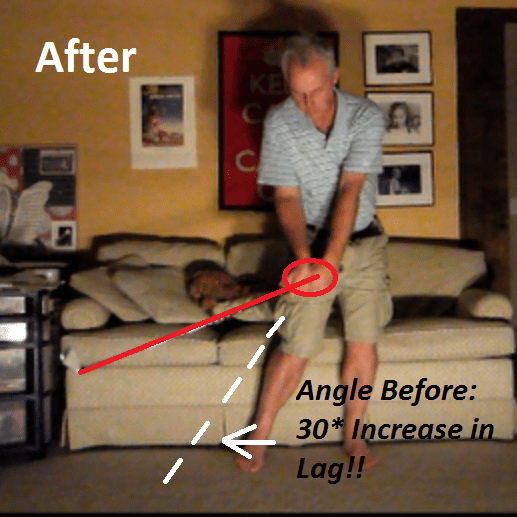 Be sure not to get this confused with the club lagging behind the body (stuck). If you tend to hit blocks to the right our snap hooks, this could be the reason. It is true the hips do need to clear, but not as aggressively as most think through the hitting area. In studies of the longest hitters in golf they found that they all decelerated their hips through impact more than shorter hitters. This is what allows energy to be transferred from the hips to the shoulders and eventually to the club. Having the correct kinematic sequence is the most important part of creating power in the golf swing. At impact you would like for your hips to be around 30-45* open and your shoulders to be square to the ball. Good luck. I hope you are having success with practicing your lag. As for the hip movement, the singular mental thought for me is to really “load into” that right leg, feeling glut muscle fully engage. This keeps me from standing up with my right leg, over-rotating, or sliding to the right. It’s difficult to really make any of those mistakes if I load into the right glut from a good setup posture. Exactly! You are right on the money Tom. Loading the right glut is a great way to achieve those things. I am glad you are having great success. Keep it going!